I had never heard of the Armenian genocide until I met Greg. He was an Armenian living in Toronto, and we were both part of a chamber group of musicians playing concerts to ‘lifers’ in Canadian jails. He told me how the determination of the Muslim Turks to eradicate all Armenian Christians had continued decades after the genocide. A Muslim threw a grenade into his family kitchen when he was 4. His mother screamed, overturned the kitchen table and dragged him behind it. It shielded them from the shrapnel. They survived. They left the Middle East for Canada. I had recently left school and received an expensive education. But at no point do I remember anyone drawing my attention to the fact that one and a half million Armenian Christians had been systematically slaughtered by the Muslim Turkish Government in a programme that started in 1915, half a century ago then – and the centenary of which occurs now. It wasn’t only the people of course. The Churches and the monasteries were also burnt to the ground or wholly demolished. All memory of them was eradicated. Clearly no one had told the Secretary General of the UN about this either. Last week he denied there was a genocide. He preferred the euphemism ‘atrocity crimes’. Turkey refuses to acknowledge the genocide. It claims there were some casualties during a period of civil ‘unrest’. One has to be careful at this point, because if Ed Miliband wins this General Election, he has promised to make Islamophobia a crime. Greg was Islamophobic. That grenade in his kitchen left him both wary and fearful. They had murdered his grandparents in Turkey and wiped out his whole community. He remained afraid. We have pathologised our culture in a way that makes it difficult to tell the truth. But we need to make a distinction between facts and opinions. It is right to afraid of some things; it may be neurotic to be afraid of others. 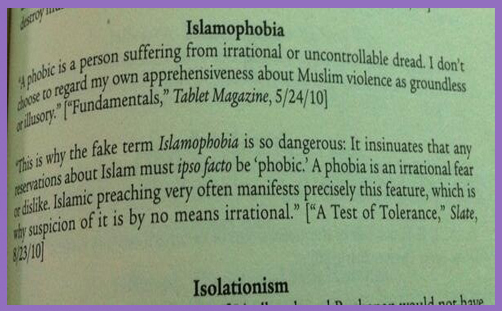 But if Miliband does make the expression of Islamophobia a crime, it will be a criminal offence to tell the truth. There are, of course, many kind, dignified and wholly attractive Muslims. It would be a terrible mistake not to be able to distinguish between gentle, amenable Muslims and Islam itself. The West has tried to do this by adopting two words in particular– ‘radical’ and ‘extreme’– to qualify Islam. The problem with this approach is that it mistakes the basic tenet of Islam, which is the requirement in the Koran and the Sira for all Muslims to imitate as closely as possible the life of Mohammed. What concept are the adjectives ‘radical’ and ‘extreme’ supposed to be qualifying? One must ask: ‘Was Mohammed himself ever radicalised?’ ‘Was Mohammed ever extreme?’ The answer to that is partly yes. He taught a spiritual religion for his 13 years in Mecca in the absence of violence. His followers throughout this period amounted to several hundred, and no more. But when he left for Medina, the Koran and his activities developed a political and violent dimension that, under the principle of abrogation, supersede his benign ‘spiritual’ stage. However, the radical Mohammed becomes the normative Mohammed. It is historical ignorance or determined prejudice to apply the epithets ‘radical’ or ‘extreme’ to violent Islamic actions which model themselves on the normative actions and teaching of the later Mohammed. Such a diagnosis involves a category error. They may be radical when compared to the Golden Rule, but Islam has no Golden Rule – it restricts itself to following the example of Mohammed himself. When the cartoonists at Charlie Hebdo were assassinated, many commentators said that it was unfair to blame Islam for such radical and extreme actions. But they were neither: they were simply and directly imitating Mohammed. When a Jewish woman poet Asma Bint Marwan satirised him in 624, Mohammed had her assassinated while she slept with her children. Is ISIS extreme or radical ? Between 622 and 632 Mohammed led 74 violent expeditions against people who refused accept or follow him. After the Battle of the Trench, he executed – by cutting off their heads – between 600 and 900 Jewish men women and children who had simply failed to overtly support him. Any attribution of extremity needs to assessed in a broad historical context. What is that context? Islam’s record of violence over the last 1400 years amounts to something like 270 million non-Muslims killed – because they were non-Muslims. It set out to destroy the Christian civilisation in all the Middle East, Egypt, Turkey, North Africa (where St Augustine of Hippo was based), and succeeded. It didn’t kill only Christians (estimated at 60 million) but also 10 million Buddhists, and 80 million Hindus. Persian Zoroastrian culture and African animists were also wiped out. I was taught at school that the Crusades were an overflow of Norman violence; younger sons restive for booty. I remember only too well writing in essays that it was the dispossessed younger sons who trekked off to smite a few Saracens. In fact, all the recent research tells us that this was nonsense. There was no such distinction amongst those who risked their lives and their lands in response to a plea for help. The facts are that as Islamic armies spread up through Palestine, and Syria, just as ISIS is spreading in Iraq today, Christians living there begged for help and protection. The crusades were a response to that plea for help in the face of violent Islamic military expansion. Boko Haram recently summarily executed prisoners held in slavery. Is slavery normative in Islam? There is very little mention among commentators that Mohammed practised, endorsed and encouraged slavery. But he did. Focused as we often are on the turbulence in American cities that flows from the early years of slavery in the States, we appear to have no historical memory that between the 16th and 19th centuries one million West European men, women and children were captured and forced into slavery. The numbers of black Africans also enslaved is estimated to be about 17 million. Rochdale has had trouble with the grooming of young girls. Is this extreme or abnormal in an Islamic context? Mohammed married his youngest wife Aisha at six, and consummated the marriage when she was aged nine. There may be political reasons why Ban Ki-Moon does not want to upset the Turkish Government and cannot tell the truth. Now I know a little more history than I was taught at school, I’m not surprised that Greg and the Armenian Christians experienced Islamophobia. But if it becomes an offence in English law to experience and express fear of Islam, many more of us may be unable to tell the truth without becoming criminals.